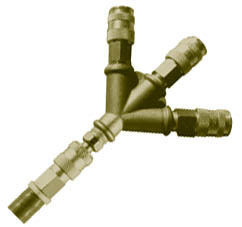 PS&E "Y" Manifolds are the perfect solution for supplying multiple outlets from a single inlet. Great for air, water, oil, and solvent applications, the "Y" Manifold is available with one inlet and either two or three outlets. Purchase your "Y" Manifolds from PS&E today.